Every day, hundreds of people fleeing insurgents in Nigeria’s north-eastern Borno State march down the long road to the safe haven of Monguno – a hot and dusty outpost of a city ringed by a huge ditch and guarded by Nigerian military. At the military checkpoint to enter the town, the families are searched, their details collected, and along with receiving food and water, the children are vaccinated against polio. These children are some of the most vulnerable, under-served children on the planet – likely to have never been to school, never learned to read, or received a day of health care in their lives. And today, they are living in the last isolated pocket of wild poliovirus transmission anywhere in Africa. Polio is the 21st century’s canary in the mine. It provides a window into the locations of some of the most health-deprived children on the planet. And today, polio exists only in three countries: far north-eastern Nigeria and the border regions of Afghanistan and Pakistan – areas lacking in functioning health systems, affected by conflict, or both. 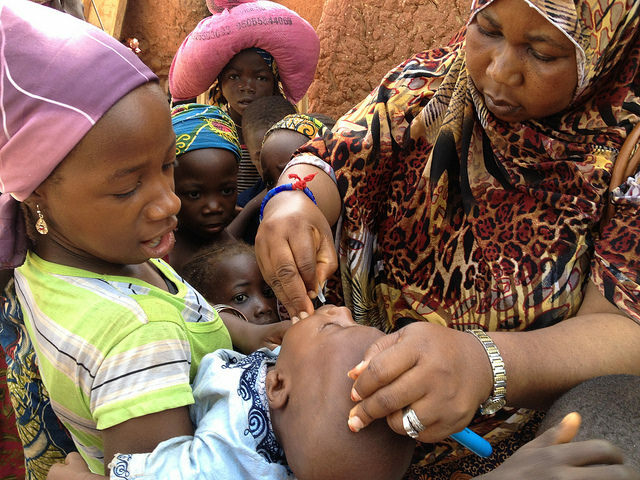 This is one of the global polio eradication programme’s greatest achievements: in order to eradicate the virus, practically every child on the planet must be immunised against it multiple times, compelling the polio programme to vaccinate children even in the most remote, fragile or conflict-affected areas. We are reaching children who often have never received any other health service, and we are proving that it is possible to live in a world where no child is left behind. In doing so, we are not only providing a raft of ‘lessons learned’ for future development programmes, but providing a platform for the delivery of additional emergency humanitarian services, such as in Borno, where at transit posts and health camps, polio immunisation is offered together with a range of health services, including screening for severe acute malnutrition, distribution of vitamin A and zinc, and the delivery of bed nets to protect families from malaria. This year, to date, there have been five cases of wild poliovirus globally; three in Afghanistan and two in Pakistan. Last year, there were 37 cases worldwide – the lowest number in history. In 1988, when the Global Polio Eradication Initiative (GPEI) was launched, there were an estimated 350,000 cases in 125 polio-endemic countries per year. The progress is extraordinary, and the goal is tantalizingly close. We are confident that the poliovirus is cornered and on the very edge of extinction, that with the full implementation of existing plans to immunise children in Nigeria, Pakistan and Afghanistan, there is every chance the virus could be eradicated for good this year or next. But we cannot afford to be complacent now – – if we fail to eradicate polio from these last remaining strongholds, it is estimated that as many as 200,000 new cases of lifelong paralysis globally could occur every year, within 10 years. We are visiting Australia this week, which is World Immunisation Week, to press Malcolm Turnbull’s Government to help the programme grasp this historic opportunity to end transmission of polio in the coming year. Our last visit was three years ago, a year in which Pakistan recorded 306 cases of polio. This year, to date, they have two, and a polio-free Pakistan will likely deliver a polio-free South Asia in the imminent future and continue to protect a polio-free Western Pacific. However, at a time when we have never been closer to eradicating this disease, the GPEI needs an additional US$1.5 billion to reach every last child. We have urged the Government to commit to new and additional funding for the GPEI so that Australian support for international polio eradication efforts would continue with at least $15 million per year through to 2020. Reducing funds now would compromise the polio eradication effort at the time when we have never been closer to eradicating this disease. The World Health Organization estimates that the benefit of a continued AU$15 million per year contribution would see 11.5 million children, nearly half the population of Australia, fully immunised against polio. Furthermore, it is projected that a polio-free world will reap savings of US$40-50 billion, funds which can be used to address other public health needs. The global health infrastructure, knowledge, and tools learnt from polio eradication will help to fight other diseases, such as measles and Ebola, and prevent future global epidemics. Our choice is clear: until we stop polio in Afghanistan, Nigeria and Pakistan, all the world’s children remain at risk of polio, or we can be the generation that ends this entirely preventable disease and protects all coming generations from polio paralysis. Historically, Australia has made a proud contribution to the eradication of global epidemic-prone infectious diseases. Smallpox was eradicated in 1979, thanks to the efforts of legendary Australian immunologist Frank Fenner and it was Australian Rotarian Sir Clem Renouf who, as President of Rotary International, initiated an immunisation project in 1979 which was a catalyst for the global polio eradication effort. 38 years later, and as Ian H.S. Riseley, the incoming and fifth ever Australian Rotary International President prepares to commence in the role, polio is on the brink of worldwide eradication. Australia has an opportunity to demonstrate its support for a polio free world by committing to new government funding with other donors at the upcoming Rotary International Convention in Atlanta, Georgia, USA in June 2017, as well as ensuring its eradication is reinforced at the upcoming G20 Health Ministers’ meeting in May. We believe that investment in polio eradication is not only a continuation of Australia’s proud history in the eradication effort, but that it is an investment in sustainable development globally, and will be the first concrete success from the Sustainable Development Goals. Last year, Australian funding was used to purchase oral polio vaccines, as part of the global vaccine switch from trivalent oral polio vaccine to the bivalent oral polio vaccine in routine immunisation schedules in non-polio-focus countries such as Laos – the first step in the complete withdrawal of oral polio vaccines in a post-polio world. We are incredibly grateful for these Australian contributions that have gone well beyond funding – at the Commonwealth Heads of Government Meeting (CHOGM) in Perth in 2011, for example, Julia Gillard’s government placed polio eradication on the agenda and hosted a press conference that saw $118 million committed by the United Kingdom, Canada and Australia to the GPEI. In response to an urgent request in 2016, the Australian Government frontloaded its current funding to disperse $30 million in flexible funding to enable the urgent purchase of much-needed vaccines and operational support in critical polio-affected and high risk countries. This followed CHOGM 2015 in Malta where Prime Minister Turnbull pushed for a global gathering that saw the UN Secretary General, the newly elected Secretary-General of the Commonwealth and the Prime Minister of Pakistan commit to eradication. These are significant and valuable contributions, but Australia cannot afford to rest on its laurels. Polio paralysis is literally on its last legs. But there is one last step to take. And we must take it. Chris Maher is the WHO Eastern Mediterranean Region Polio Manager, and Reza Hossaini is the UNICEF Director of Polio Eradication. Chris Maher has over 20 years experience in the fight to eradicate polio. He is the WHO Eastern Mediterranean Region Polio Manager. Mr. Reza Hossaini is the Director of Polio Eradication, based in UNICEF Headquarters, New York. He is responsible for management of the organization’s work within the partnership of the Global Polio Eradication Initiative. Prior to this appointment, Mr. Hossaini served as UNICEF Representative in Uzbekistan, having previously served as Representative in Zimbabwe, Sri Lanka, and Turkey. Mr. Hossaini began his career with UNICEF in 1989 as Assistant Representative in Tehran, Iran. He then joined World Health Organization as SIA Polio Coordinator in the Horn of Africa and South East Asia Region. He returned to UNICEF in 2002 as Senior Programme Coordinator Afghanistan. Prior to joining the UNICEF, Mr. Hossaini worked in the private sector (pharmaceutical and vaccine production). Mr. Hossaini obtained his degree in Industrial Pharmacy (1981) from the College of Pharmacy, Delhi University and his Post Graduate Degree in Hospital Management from All India Institute of Medical Science in New Delhi.